To keep your business operating efficiently and safely, consider Joe Ward Roofing, expert Miami roofers, to provide commercial roofing services. We do everything for businesses and commercial property owners: leak repair, flat roof repair, metal roof repair, emergency storm repairs and much more. When it comes to roofing in Miami FL, you can feel good about choosing our team to handle the job, as we have experience and expertise that has been proven effective over the past three decades. We were established in 1986, growing our reputation over the years to become your trusted provider of roofing in Miami FL. From re-roofing to maintenance, Joe Ward Roofing does it all: roof repair for metal, tile, shingle, and flat roofs. We also offer green solutions for commercial businesses to slash their energy consumption through green roofing and solar panels. Because our professionals do this type of work every single day, we bring something valuable and unique to the table, especially when you consider we are GAF Master Elite Roofing Contractors. We take on the challenge of commercial roofing proudly, using only the very best materials available in the industry today. You want to choose someone with experience and knowledge of the commercial roofing industry, as commercial roofs pose very different challenges than residential. 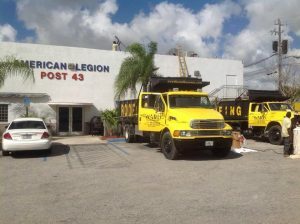 Need Miami roofers you can trust to keep your business going for many years to come? Lean on the fully licensed and insured Joe Ward Roofing team for a free, no-obligation estimate at 305-233-6316 in Florida City or 561-741-8919 in Jupiter.